This is used to against alternator diode plate disease these are offered in customized options to meet clients specifications and can be bought at market leading prices. Being amongst the leading organization, we specialize in manufacturing, supplying and exporting a precisely designed array of Blade Fuse Holders. Manufactured by using advanced technologies and optimum quality raw material, our complete product range is acknowledged among the clients for their matchless features. To maintain consistent flow of quality approved range, we follow various industrial recommended quality testing measures in our operations. Leveraging on long industry experience and advance technologies, we Karan Enterprises have been serving several eminent customers since 1995. 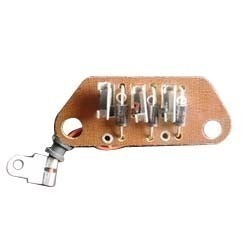 Our company comes among the most reputed manufacturer, exporter, trader, and distributor of Rectifier Plate, Voltage Regulator, Indicator Flasher, Head Lamp Relay, Heater Timmer, Glow Plug Timmer, etc. We have developed robust infrastructural set up that enables us to keep pace with the latest market requirements. It is the most integral part of our company that has earned us the capability to design and develop the world's best products. All the products are precision designed and developed incorporating international standard quality norms. Our manufactured and traded products are widely appreciated for their sturdiness, durability, longevity, and excellent performance during usage. They have higher demand in domestic as well as international markets. We export these products to various countries including Sri Lanka, and Germany. All the products are stringently tested prior to final dispatch at client's end.